Own Justins House - Christmas All Wrapped Up DVD from Deff, DVD, Blu-Ray & 4K Video Specialists - Free UK Delivery..
Own Justins House - Going for Gold DVD from Deff, DVD, Blu-Ray & 4K Video Specialists - Free UK Delivery..
Own Justins House - Oh No Its Auntie Justina DVD from Deff, DVD, Blu-Ray & 4K Video Specialists - Free UK Delivery..
Justin’s House features BAFTA award-winning CBeebies presenter Justin Fletcher as he moves into a brand new zany house. Justin is helped by enthusiastic comic characters Robert, his Robot Butler; Little Monster, who likes to play and Dee Livery, the uni-cycling delivery lady. The Wishing Wardrobe: Justin is very excited to discover a fancy dress is taking place in Justin Town. Race Day: Justin plans to ride his old bicycle Zoomer to vic..
Own Justins House - The Fantastic Bumper Collection DVD from Deff, DVD, Blu-Ray & 4K Video Specialists - Free UK Delivery..
Own Justins House - The Mystery Pong DVD from Deff, DVD, Blu-Ray & 4K Video Specialists - Free UK Delivery..
Own Justins House - The Tooth Fairy DVD from Deff, DVD, Blu-Ray & 4K Video Specialists - Free UK Delivery..
Justin's House features BAFTA award-winning CBeebies presenter Justin Fletcher as he moves into a brand new madcap house. 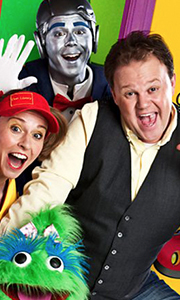 Justin is helped by enthusiastic comic characters Robert, his Robot Butler, Little Monster, who likes to play and Dee Libvery, the unicycling delivery lady. Moving In: Moving day arrives for Justin, but he finds two characters already living in his new home. Housewarming: After getting comfortable in his new home, Ju..